At the extreme eastern end of the Gulf the veil is lifting to reveal a boating destination that rivals anywhere in the world. Compared to the other five GCC Gulf States, the Sultanate of Oman has been a quiet backwater of a boating market, but now it’s emerging on to the Middle East boating scene as THE place to be. My first visit to Oman was in 1987, in the days when as a European it was difficult country to visit, tourism was only for the very select few and business visits required a lengthy visa procedure, although for GCC nationals the procedure was much easier. i vividly remember launching in a 30’ outboard powered boat from a trailer at Muscat’s Capital Yacht Centre into the brilliant clear blue water and being shown the mountainous coastline and superb fjord like bays with brilliant diving and fishing. Twenty years on, a lot is changing in terms of infrastructure with waterside housing developments and marinas, but in a caring way that typifies the tasteful and cultural approach to tourism of the Country’s ruler, Sultan Qaboos bin Said. But what’s not changing is the natural wonder of the country, it remains pristine and unspoilt. 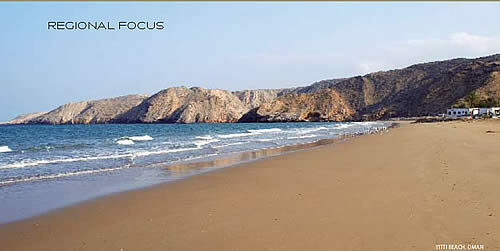 Oman has a coastline that is 1,200 km long and the country has the second largest land area in the GCC after Saudi Arabia. Without a doubt Oman offers the best leisure boating in the Middle East and with relaxed entry rules for westerners, tourism is a developing industry and is recognised as one of the main target sectors for investment and growth. However the Government has gone to considerable lengths to ensure that infrastructure and real estate developments match the natural surroundings, lack of high-rise development is perhaps the most obvious sign to the visitor. So why has Oman remained relatively unknown as the Gulfs best boating market? The answer lies with money, a lack of oil and gas wealth meant that expensive marinas and waterside development projects were few in number. now the market is changing for leisure boating with record oil and gas revenues and a developing tourism industry based on the rich heritage and culture of the country and a growing network of marinas. The 1,200 km long coastline is simply stunning, especially south of Muscat where the Hajar mountain range rises up to over 3,000 metres and intercepts the coastline with towering cliffs interspersed by hidden sandy coves and magnificent beaches where you will be lucky to see another person. The waters teem with fish and offer some of the best diving in the region. the director General of Planning for the Ministry of Tourism “Currently tourism represents only 1% of the Omani GdP but its set to grow as it has been identified as a key sector. Oman takes development of its coastline very seriously with emphasis on preserving its rich heritage and the natural habitat and we feel that leisure boating is an activity that can fit in with this by providing a network of marinas along the coast. The marinas will mainly be part of integrated tourist resorts where property can be sold on a freehold basis to overseas nationals. We have two marinas in operation in the country with another ten under construction or at the planning stage, two in the north of the country in the Musandam area, one in Sawadi, five in the area of the capital city of Muscat and two in the south of the country in Salalah. The development of a network of marinas will open up Oman as a serious boating area and as a stopover for yachts making the passage from the Mediterranean and the red Sea to the Gulf and Asia. The Wave will be one of the first integrated Tourism resorts with residential property. The development will include four hotels, 2,500 residential apartments and 1,500 villas and town houses. Part of the development will be on reclaimed land going out 600 metres from the shore which will embrace a 300 berth marina, to be operational by 2009 and a flushing canal system that will bisect the residential areas. According to John langford Vice President for Sales and Marketing The Marina is at the heart of the development which we have had enormous interest in. Phase one released now 90% sold out. The marina will have berthing for 300 boats with another 300 being accommodated on a dry stack and a 70 ton marina hoist for a repair facility. 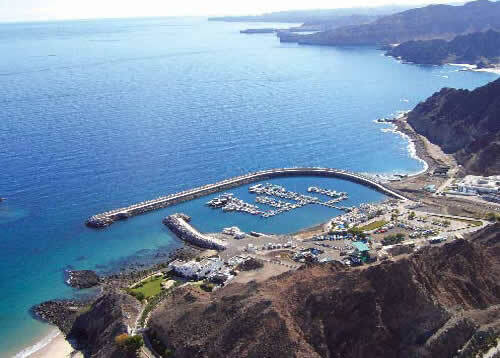 is situated close to the capital city of Muscat and was the first marina in Oman. Operational since 1995 the Marina is owned by the Government and managed by the dubai based island Global Yachting Group who took over in 2006. According to Manager Bob looker "The marina is full with 140 boats on water and 140 on land, we are looking to double these numbers with expansion in the near future". One of our key objectives will be to re structure the berthing as the trend is for larger Motor Yachts over 15 metres. We are getting increasing interest from overseas customers from other Gulf countries and even from Europe for berthing. Costs in Oman are relatively low, fuel is 20% of European prices, berthing for a 28 metre Yacht is 6,500 euros per year and we have our own travel lift and workshop facilities available for maintenance". The Barr Al Jissah resort near Muscat is situated in a bay surrounded by mountains and comprises three luxury Hotels, private apartments and villas and is managed by the Shangri-la Group. The complex has a 50 berth marina, the second operational marina in Oman. Manager Simon Stephen is overseeing the final completion of the project says, The marina is looking after three sectors, the resort charter boat fleet, berthing for boats owned by the residents of the 78 villas and apartments and for visiting Yachts. We are expanding the marina shortly to 80 berths, adding six 30 metre and one 60 metre berth for larger yachts. We anticipate Muscat becoming a regular destination for larger Yachts from dubai and other Gulf countries. The Oman Marine Industry With the number of leisure boats in Oman less than 1,500 the market has never had the volume of scale to support any boat sales operations and most customers in the past have purchased direct from the manufacturer. local builders based in the UAE and Bahrain have supplied some 90% of the boats sold. With the growth in the marina network this will change as boat manufacturers realise the growing market potential. All outboard engine manufactures are represented in Oman, there being a sizable market (with the fishing fleet of many of thousands) of fibreglass boats in the size range up to 10 metres. There are no leisure boat manufacturers in Oman, although Amiantit Oman, a large company in the plastics business in Muscat manufacturers fishing boats under licence from Yamaha in Japan. With the growth of the marina network the leisure boat industry in Oman is set for sizable growth with boat numbers likely to double in five years. © Mike derrett, 6th February 2007. Author Mike Derrett has worked in the leisure marine industry since 1970.